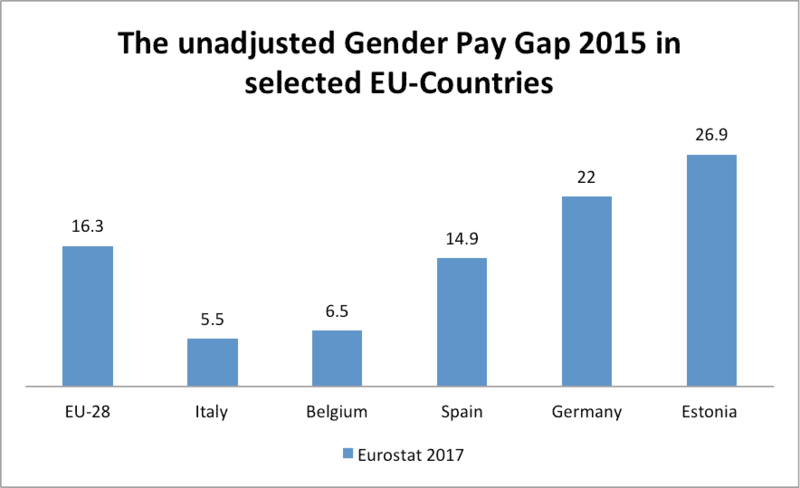 Though the two principles “equal pay for equal work” and “equal pay for work of equal value” have been legally fixed with the European Treaty of Rome 1957 as well as with the subsequent Equal Pay Directive 1975, the EU still shows – latest data from 2015 – an average (unadjusted) gender pay gap of 16.3%. That means that the average gross hourly earnings of female employees are 16.3 % below those of men. Even so, there are huge differences among the 28 member states: While the gender pay gap in Italy and Luxembourg is only at 5.5%, it is at 26.9% in Estonia. Research gives evidence that the gender pay gap is caused by several interrelated factors: (1) labour market segregation by gender and the corresponding unequal distribution of women and men in sectors, occupations, and positions (horizontal and vertical segregation); (2) the fact that women (more often than men) take career breaks and/or work part-time due to care responsibilities, which has negative effects on their service length (seniority); (3) the fact that so-called ‘women’s jobs and sectors’ are often lower-paid jobs and sectors owing to existing collective agreements; (4) opaque and unsystematic wage-setting processes and individual pay agreements that are often less advantageous for women. These factors show that closing the gender pay gap is still a challenge. But what needs to be done? Some European countries have introduced laws designed to narrow the gender pay gap. Belgium can be seen as good example for such legal framework. Though at 6.5% its gender pay gap is rather low, specific legislation (see here) came into force in 2012. This law follows the idea that the gap should be discussed by the social partners at all levels of collective bargaining (national, sector, company). Further all job classification systems have to be analysed with regard to their gender neutrality by the FPS for Employment, Labour and Social Dialogue (see here). Social partners play a decisive role in this process. In Germany, on the contrary, where the gender pay gap is at 22% and therefore relatively high, this kind of state intervention in collective bargaining is pretty unlikely since unions defend the principle of autonomous negotiations. Instead the German government has recently agreed on a new act of law through which income structures are to become more transparent. The new Law on Pay Transparency which came into force on July 6 this year entitles workers in companies with more than 200 employees to receive information on the wages paid to colleagues doing comparable work. In companies bound by collective bargaining agreements, works councils will administer this legal entitlement; in companies without works councils, employees have to take their case to the employer. Furthermore, an evaluation procedure has been introduced for companies with more than 500 employees. This procedure needs to be carried out at least every five years. Incorporated companies with more than 500 employees are to report on equal opportunities measures as well as on equal pay on a regular basis. Employer bodies in particular (e.g, the Federal Association for medium-sized businesses) have called the new law over-bureaucratic and not practicable. It is further argued that pay inequalities result from different career patterns and individual choices of women (and men): If women were working in the same sectors and professions as men and if they were working full-time and did not interrupt their professional careers, the wage differences between women and men would be much lower. The argument that the gender pay gap results from individual choices or women’s preferences needs to be questioned for several reasons: First, so-called individual choices are embedded in institutional structures such as the welfare system and its gender regimes. Second, wage composition is a complex process and is often based on gender stereotypes, historical developments and power relations. Therefore it is necessary to contextualize and interpret wage differences against this institutional background. What’s more, we need an approach that understands the complexity of the gender pay gap, and how it interfaces at different levels — professional, organisational, and that of the state. What does this mean for political actors? The Belgian approach provides some orientation regarding the different valuation of so-called women’s and men’s work. Bargaining parties and political actors are asked to work on a revision of current job classifications and replace them with gender-neutral ones in order to end the undervaluation of ‘women’s’ professions. At organizational level this requires active measures against gender stereotypes accompanied by enhanced career opportunities for part-time workers so as to tackle horizontal and vertical segregation. And at welfare state level, institutional frameworks need to be enhanced as regards the number and quality of affordable childcare facilities so as to improve employment opportunities for parents (especially mothers). Further information on European activities and research findings of the project “New solutions for an old problem: Developing transnational strategies together with trade unions and gender equality units to tackle the gender pay gap”, funded by the European Commission within the PROGRESS Programme, can be found here. One may also join the gender wage watchers network. 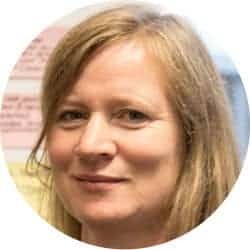 Alexandra Scheele is Professor of the Sociology of Gender and Work, University of Bielefeld.